On the occasion of the State visit of His Excellency the Presidend of the Republic of Lebanon General Michel Sleiman on 6-8 December 2012, the Hellenic Federation of Enterprises (SEV) and the Arab-Hellenic Chamber of Commerce & Development (AHCCD) with the support of Consolidated Contractors Company (CCC) co-organised the meeting of the Business Council Greece-Lebanon which was held at SEV’s premises on Friday, December 7th, 2012 at 14:30. 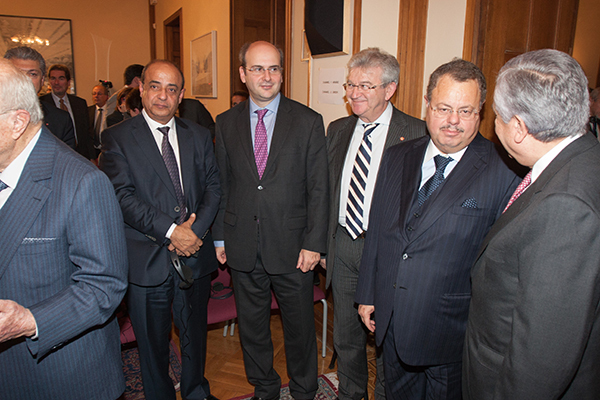 The meeting was attended by the President of the Hellenic Republic H.E. 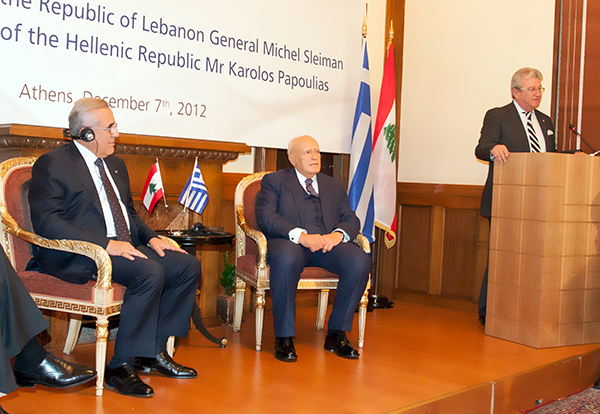 Mr. Karolos Papoulias and the President of Lebanon, H.E. General Michel Sleiman. They both addressed the business communities attending the meeting. Opening speeches were addressed by the President of SEV Mr. Dimitris Daskalopoulos, the President of the Business Council Mr. Thanasis Lavidas, the President of AHCCD Mr. Christos Folias. Also addressed the audience the Vice Executive President of CCC, Mr. Tawfiq Khoury followed by the Minister of Economy and Trade of Lebanon, H.E. Mr. Nicolas Nahas, the Minister of Development, Competitiveness, Infrastructure, Transport and Networks, H.E. Mr. Kostis Hatzidakis, the Secretary General of International Economic Relations and Development Cooperation of the Ministry of Foreign Affairs, Mr. Panagiotis Michalos. Afterwards the B2B meetings of the Lebanese Businessmen with their Greek counterparts took place at the premises of SEV. The President of the Arab-Hellenic Chamber of Commerce & Development (AHCCD), Mr. Christos Folias, H.E. 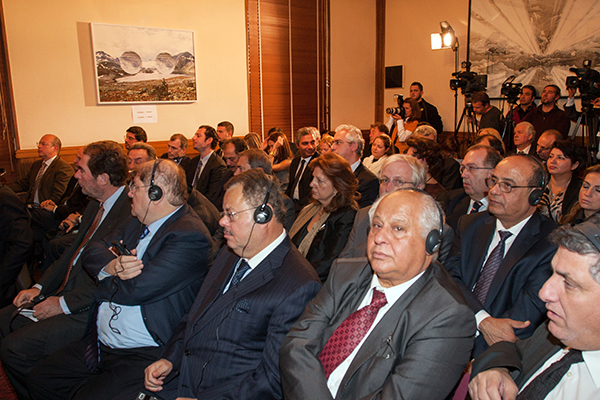 the President of Hellenic Republic, Mr. Karolos Papoulias, H.E. the President of the Rebubic of Lebanon, General Michel Sleiman. The Chairman of the Hellenic Federation of Enterprises (SEV), Mr. Dimitris Daskalopoulos, H.E. the President of the Hellenic Republic, Mr. Karolos Papoulias, H.E. 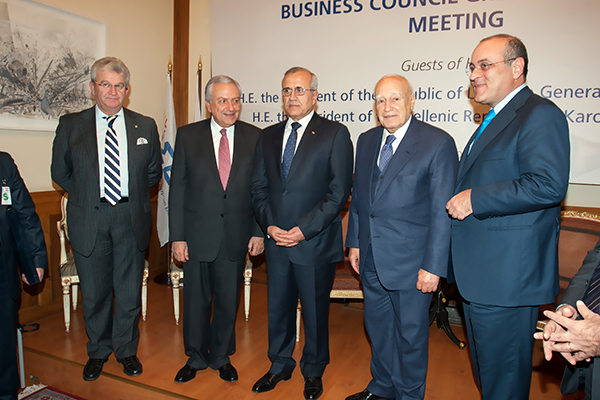 the President of the Republic of Lebanon, General Michel Sleiman, the Chairman of SEV Business Council for International Activities, Mr. Athanase Lavidas, the President of the Arab-Hellenic Chamber of Commerce & Development (AHCCD), Mr. Christos Folias. The Chairman of SEV Business Council for International Activities, Mr. Athanase Lavidas, the Vice Executive President of CCC, Mr. Tawfic Said Khoury, the President of the Arab Hellenic Chamber of Commerce & Development, Mr. Christos Folias, H.E. the Minister of Development, Competitiveness, Infrastructure, Transport and Networks, Mr. Kostis Hatzidakis, the Secretary General of the Arab Hellenic Chamber of Commerce & Development, Mr. Rashad Mabger.